See the most recent messages from Grant County Emergency Management Agency, powered by Nixle. Extreme winter weather is responsible for the deaths of hundreds of people in the United States each year, primarily due to vehicle crashes, fires from improper use of heaters, overexertion, and exposure. Make a Family Communication Plan Your family may not be together when disaster strikes, so it is important to know how you will contact one another, how you will get back together and what you will do in case of an emergency. Make an Emergency Kit for at least three days of self-sufficiency. Keep space heater safety in mind: Use electric space heaters with automatic shut-off switches and non-glowing elements. Remember to keep all heat sources at least three feet away from furniture and drapes. Make sure you have a cell phone with an emergency charging option (car, solar, hand crank, etc.) in case of a power failure. People who depend on electricity to operate medical equipment should have alternate arrangements in place in case power is out for an extended period of time. Plan to check on elderly/disabled relatives and neighbors. Plan to bring pets inside. Know where the manual release lever of your electric garage door opener is located and how to operate it in case you lose power. Fill a gallon container with water and place them in the freezer to help keep food cold. Listen to local area radio, NOAA radio or TV stations for the latest information and updates. Be prepared to evacuate if you lose power or heat and know your routes and destinations. Find a local emergency shelter. Check emergency kit and replenish any items missing or in short supply, especially medications and medical supplies. Keep it nearby. Be sure you have ample heating fuel. If you have alternative heating sources, such as fireplaces, wood- or coal-burning stoves, or space heaters, be sure they are clean and in working order. Check that your fire extinguisher(s) is in good working order, and replace it if necessary. Bring your companion animals inside and ensure that your horses and livestock have blankets if appropriate and unimpeded access to shelter, food, and non-frozen water. Continue listening to local news or a NOAA Weather Radio for updated information and instructions. Access to some parts of the community may be limited or roads may be blocked. Help people who require special assistance—infants, elderly people, those without transportation, large families who may need additional help in an emergency situation, people with disabilities, and the people who care for them. Avoid driving and other travel until conditions have improved. Avoid overexertion. Heart attacks from shoveling heavy snow are a leading cause of death during the winter. Check on your animals and ensure that their access to food and water is unimpeded by drifted snow, ice, or other obstacles. If you are using a portable generator, take precautions against carbon monoxide poisoning, electrocution and fire. Make sure your home is well insulated and that you have weather stripping around your doors and window sills to keep the warm air inside. Make sure you have a working carbon monoxide detector. Keep fire extinguishers on hand, and make sure everyone in your house knows how to use them. House fires pose an additional risk, as more people turn to alternate heating sources without taking the necessary safety precautions. Insulate your home by installing storm windows or covering windows with plastic from the inside to keep cold air out. Hire a contractor to check the structural ability of the roof to sustain unusually heavy weight from the accumulation of snow - or water, if drains on flat roofs do not work. If you have a wood burning fireplace, consider storing wood to keep you warm if winter weather knocks out your heat. Also, make sure you have your chimney cleaned and inspected every year. Plan long trips carefully, listening to the radio or television for the latest weather forecasts and road conditions. If bad weather is forecast, drive only if absolutely necessary. Do not drive through flooded areas. Six inches of water can cause a vehicle to lose control or possibly stall. A foot of water will float many cars. Slow down! Even if the roads just look wet they could still be slick. More than 6,000 fatalities occur on the roadways each year due to weather conditions. Make sure your vehicle is completely clear of ice or snow before starting the trip. Flying snow from cars causes accidents. Let someone know where you are going and what route you will take. If something happens, this person will know where to start a search. Don't leave the house without the following a fully charged mobile phone and car charger and a emergency supplies kit in your car. If you are driving and begin to skid, remain calm, ease your foot off the gas and turn your wheels in the direction you want the front of the car to go. If you have an anti-lock braking system (ABS), apply steady pressure to the brake pedal. Never pump the brakes on an ABS equipped vehicle. If you are having trouble seeing due to weather conditions, pull over to the side of the road and stop your car until visibility improves. Turn off your lights and use your parking break when stopped so that another car won't mistakenly follow your tail/brake lights and end up hitting you. If you leave your vehicle, you will become disoriented quickly in wind-driven snow and cold. Run the motor about 10 minutes each hour for heat. While running the motor, open the window a little for fresh air to avoid carbon monoxide poisoning. Clear snow from the exhaust pipe to avoid gas poisoning. Turn on the dome light at night when running the engine. Tie a bright colored cloth, preferably red, to your antenna or door. After snow stops falling, raise the hood to indicate you need help. Cold weather puts extra strain on the heart as the body tries to keep warm. Anyone performing hard work in the cold should take breaks regularly. Because the body is already working hard just to stay warm, it is possible to be overheated as well. Try to stay indoors when weather is extremely cold, especially if winds are high. If you must go outdoors, make trips outside as brief as possible. Frostbite freezes the skin and can result in loss of feeling and even amputation. The risk of frostbite increases for those with poor blood circulation and people who are not dressed properly for the extremely cold temperatures. Do not use direct heat from heating pads, radiators or fires. Colder temperatures can cause hypothermia, a condition where the human body is at an abnormally low temperature. The condition affects the brain and someone suffering from hypothermia may not realize what is happening nor do anything about it. If you notice any of these signs, take the person’s temperature. If it is below 95° F, the situa tion is an emergency—get medical attention immediately! Caution: Each year, an average of 430 Americans die from unintentional carbon monoxide poisoning, and there are more than 20,000 visits to the emergency room with more than 4,000 hospitalizations. Carbon monoxide-related deaths are highest during colder months. These deaths are likely due to increased use of gas-powered furnaces and alternative heating, cooking, and power sources used inappropriately indoors during power outages. Never use a generator, grill, camp stove or other gasoline, propane, natural gas or charcoal¬ burning devices inside a home, garage, basement, crawlspace or any partially enclosed area. Locate unit away from doors, windows and vents that could allow carbon monoxide to come indoors. Keep these devices at least 20 feet from doors, windows, and vents. The primary hazards to avoid when using alternate sources for electricity, heating or cooking are carbon monoxide poisoning, electric shock and fire. Install carbon monoxide alarms in central locations on every level of your home and outside sleeping areas to provide early warning of accumulating carbon monoxide. If the carbon monoxide alarm sounds, move quickly to a fresh air location outdoors or by an open window or door. Call for help from the fresh air location and remain there until emergency personnel arrive to assist you. 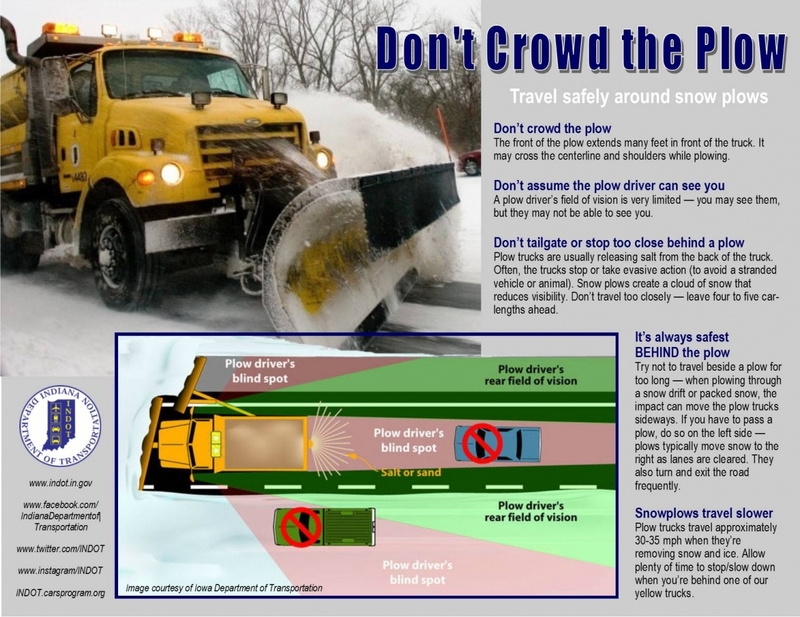 In the winter, INDOT snowplow drivers are out on the roads to keep them clear of snow and ice and keep you safe. Distance: Give snowplows room to work. The plows are wide and can cross the centerline or shoulder. Don’t tailgate and try not to pass. If you must pass, take extreme caution and beware of the snow cloud. Speed: Snowplows travel below the posted speed limit. Be patient. Allow plenty of time to slow down. Remember, Ice and Snow, Take it Slow. Vision: A snowplow operator’s field of vision is restricted. You may see them, but they don’t always see you. Keep your distance and watch for sudden stops or turns.